While I've kept season seven plot details to a minimum, please be aware that this review does include some SPOILERS for the show's previous seasons. Be sure to check out our reviews for season one, season two, season three, season four, season five, season six, season one (Dolby Atmos Steelbook), season two (Dolby Atmos Steelbook), season three (Dolby Atmos Steelbook), and season four (Dolby Atmos Steelbook). Special Features: From Imagination to Reality: Inside the Art Department- Extensive two-part featurette detailing the astonishing work of Production Designer Deborah Riley and her Art Department, dissecting the process behind the creation of this season's incredible new sets, including Dragonstone, Casterly Rock, Highgarden, the Dragonpit, and more. Fire & Steel: Creating the Invasion of Westeros- Revisit this season's most pivotal moments with this behind-the-scenes featurette, including interviews with key cast and crew breaking down how fans' favorite moments were created. Audio Commentaries- Commentaries on every episode with cast and crew including David Benioff, D.B. Weiss, Jacob Anderson, Gwendoline Christie, Liam Cunningham, Kit Harington, Lena Headey, and more. Conquest & Rebellion: An Animated History of the Seven Kingdoms- From the Game of Thrones realm comes the never-before-seen story of the tumultuous events that shaped the world of Westeros for thousands of years before the series start. Cast members Pilou Asbæk (Euron Greyjoy), Nikolaj Coster-Waldau (Jaime Lannister), Aidan Gillen (Littlefinger), Conleth Hill (Varys), Harry Lloyd (Viserys Targaryen) and Sophie Turner (Sansa Stark) team up to narrate the animated telling of Aegon Targaryen's attempts to conquer the Seven Kingdoms, written by show writer Dave Hill. As the cold winds of winter finally make their way across the show's seventh season, Game of Thrones fully enters its third act. Long gestating plotlines converge at last, once distant characters meet face-to-face for the first time, and a truncated episode order presents a notably escalated pace marked by a chain of exciting set pieces. But as engrossing as the overall storyline remains and as breathtakingly cinematic as the production continues to be, the series also appears to be moving closer and closer toward the type of conventional TV tropes and arcs that it once seemed to relish subverting. Though the show is still among the best the medium has to offer, a few narrative shortcuts and fan service moments reveal some rather stark (pun intended) changes in the writers' overall approach to storytelling. Based on George R.R. Martin's "A Song of Ice and Fire," the show once again focuses on the fictional medieval land of Westeros and all those who vie for its control. After crossing the Narrow Sea, Daenerys Targaryen (Emilia Clarke) finally arrives in her birthland to reclaim the Iron Throne. Meanwhile, the current Queen, Cersei Lannister (Lena Headey), clings to her crown and prepares for the invasion. But the battle over the Seven Kingdoms might be all for naught if the White Walkers breach The Wall in the north. As the army of the dead marches south, Jon Snow (Kit Harrington) attempts to woo Dany and her dragons to his cause, hoping to amass a defense strong enough to save the realm before it's too late. While I don't want to give too much away for those who haven't watched these episodes yet, getting to see Daenerys interact with characters in Westeros for the first time while she finally begins her war for the throne proves to be one of the season's highlights. We've spent six years watching her grow from a meek girl into a powerful leader while she has gradually gained an army of loyal soldiers and learned how to rule -- and to actually see her arrive at Dragonstone and start taking back her land leads to some genuinely satisfying payoff. Of course, the war isn't as simple as it first appears, and some surprising setbacks bring ample drama to what initially seemed like a pushover. After all, conquering isn't so easy if you have a conscience. This results in a string of truly striking battle sequences, including a harrowing ship attack and a fiery dragon assault. That latter set piece is particularly memorable, and just might be one of the show's most thrilling and emotionally tumultuous action scenes as it becomes hard for the viewer to truly pick a side in the skirmish. At the same time, the threat to the north brings an even more dangerous enemy into the mix, leading to another notable combat sequence set across a frozen lake. Likewise, developing alliances, strained relationships, intriguing new character pairings, and some long-awaited reunions all offer engaging plotlines to follow in between the swords and fireballs. But as compelling as most of the season is, the show veers more toward typical TV storytelling tropes here than in previous years. The lack of detailed source material to work from (we are now well beyond Martin's published books), the smaller seven-episode order, and the general realities of reaching the third act of the story could all be contributing factors in this regard. Though I actually like the faster pace for the most part, it's a bit disappointing to see how quickly we skim over some of Dany's initial strategy and losses. Likewise, the time it takes to travel between locations is just getting silly now, as characters seem to hop from one side of the map to another between cuts. I understand that not all of the different storylines are necessarily happening concurrently, but some of the jumps here are hard to buy -- even for a show with dragons. Though episode six's "men on a mission" plotline is undeniably entertaining, the fan-service dream team feels oddly out of place for a show that usually goes out of its way to avoid such conventions. And despite the truncated episode order, there are still a few subplots that feel like filler. This is especially true of the friction between Arya and Sansa, which all ultimately comes across as forced drama. Finally, a certain level of diminished stakes also lessens some of the show's impact, as a few characters survive some dicey situations that would have surely meant doom in earlier seasons. It's understandable that the main characters left at this point so late in the story likely all have a part to play in the show's endgame, but the lack of major deaths feels a bit strange for a show that used to unashamedly kill off its protagonists. On that note, it's also now more clear who's truly been important to the story from the beginning and who never really was, making some of those shocking early deaths feel a little less daring. Still, despite any shortcomings, the season manages to end on a strong note, setting the stage nicely for the show's final six episodes. As old debts are paid and new alliances are forged, Game of Thrones once again offers a powerful tale of warring rulers, scheming lords, powerful beasts, and honorable heroes who refuse to repeat the sins of the past. 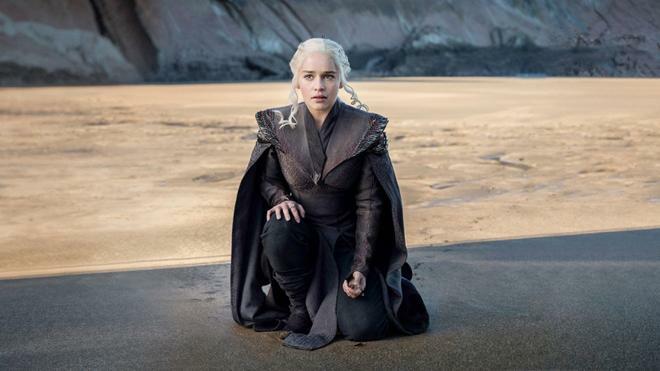 Viewers will have to sit tight a bit longer for the return of "The Prince That Was Promised," but in the meantime, these seven episodes should tide fans over during the long winter -- and grueling wait for season eight -- left ahead. 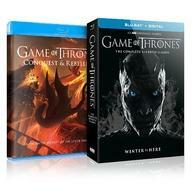 HBO presents Game of Thrones: The Complete Seventh Season in a Blu-ray/Digital Copy Combo pack. Three BD-50 discs are housed together in a foldout case that comes packaged in a sturdy outer case with the Night King's cold gaze adorned on the front and the words "Winter is Here" on the back. A clear plastic slipcover is also included which layers the title onto the front and some falling snow onto the back when placed over the package. And thankfully, unlike last season, the foldout case is like the earlier seasons with a tray for each disc rather than a stacking method. The version reviewed here also includes the Conquest and Rebellion bonus disc in a separate thin keepcase. An insert with instructions for an UtltraViolet/iTunes digital copy is featured as well. The packaging indicates that the release is region A coded. From Imagination to Reality: Inside the Art Department- Extensive two-part featurette detailing the astonishing work of Production Designer Deborah Riley and her Art Department, dissecting the process behind the creation of this season's incredible new sets, including Dragonstone, Casterly Rock, Highgarden, the Dragonpit, and more. The show is provided with a 1080p/AVC MPEG-4 transfer in the 1.78:1 aspect ratio. While the video still offers some of the most impressive imagery from any TV series on Blu-ray, the score is held back some by a few intermittent encoding issues which prove to be a bit more prevalent here than in earlier seasons. The digital source is mostly clean and stable, but a few darker scenes here and there reveal occasional compression artifacts. Most notably, false contouring/posterization crops up in shadows and skies in a few nighttime sequences or shots set in dimly lit locations. The skies behind The Hound and Thoros when they are burying the dead family they find in episode one, the walls in the dungeon with the Sandsnakes and Cersei in episode three, the Winterfell crypt in episode four, or the shadows on Bran's wheelchair in his scene with Sam in episode seven are all good examples. Thankfully, the vast majority of the presentation across these seven episodes is problem free and rather gorgeous. 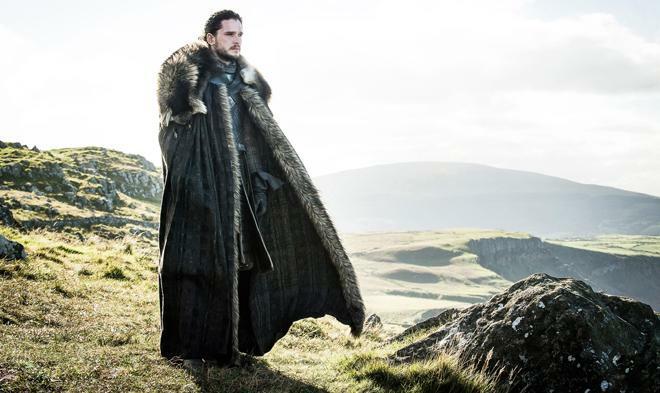 Clarity is often exceptional, highlighting the show's incredible production and costume designs while rendering every sharp texture on the cliffs of Dragonstone, every pattern on various dresses and plates of armor, every scale on each dragon, and every strand of fur on Jon Snow's cloak with impressive fine detail. And though the overall color palette veers toward a cooler and bleaker tone as winter sets in, these blue tinged scenes toward the north and remnants of warmer tones that remain in the south offer pleasing saturation. Blacks are usually nicely balanced and deep, but some darker scenes can get a tad murky and flat at times. Brighter and more colorful scenes, however, result in some striking depth, bringing the show's breathtaking locations to life. At its best, Game of Thrones: The Complete Seventh Season is genuine demo material. Unfortunately, some minor stability issues end up bringing the score down a tad, but the Blu-ray presentation still easily bests the broadcast and streaming versions of the show. The series is presented with an English Dolby Atmos soundtrack (Dolby TrueHD 7.1 core). Likewise, a standard English Dolby Digital 5.1 track and several foreign language audio and subtitle options are included as well. It should be noted, however, that the discs default to the standard Dolby Digital 5.1 soundtracks upon startup, so Atmos and TrueHD users should make sure to switch the audio settings in the menu before watching any episodes. Speech is clear, clean, and well prioritized throughout giving ample presence to every whispery threat or triumphant battle cry. Like previous seasons, the show continues to offer a versatile mixture of quiet, dialogue heavy scenes and much more aggressive set pieces filled with room-shaking effects. Key action sequences like Euron's ship attack, the "loot train" battle, the frozen lake skirmish with the White Walkers, and the climactic events at The Wall in the finale all bring thunderous LFE and absolutely engulfing surround work with seamless imaging and lively directionality -- spreading clanking swords and undead shrieks all around the listening area. The galloping Dothraki horde offers especially commanding bass and scenes involving the dragons all prove to be highlights. On that note, overhead effects are also employed well, often through rousing music cues, an extension of general ambience like wind and crashing waves, or through the deliberate placement of specific sounds when called for -- typically when the dragons are in play. Bellowing screeches, roaring flames, swooping wings, and falling debris all hit the heights, organically transitioning from speaker to speaker as they move about the room. But as memorable as these major set pieces are, I continue to be impressed by just how delicately immersive the show's smaller moments manage to be. Even simple conversations set in the courtyards of Winterfell are still full of subtle background life, with clanking tools, horses, and other murmurs always bringing an added sense of texture to the environment. Powerfully aggressive during action scenes and remarkably nuanced during quieter sequences, Game of Thrones offers another stellar Atmos mix for its seventh season. As fans have come to expect, HBO has put together a nice assortment of supplements, including eleven commentaries, two behind-the-scenes documentaries, and a great look at the series' deep history and lore. All of the extras are presented in 1080p with Dolby Digital 5.1 sound unless noted otherwise. Audio Commentaries – Disc one includes one commentary for episode 1, two commentaries for episode 2, and one commentary for episode 3. Participants include cast members like Gwendoline Christie, John Bradley, and Nathalie Emmanuel, along with director Jeremy Podeswa, writer Bryan Cogman, costume designer Michele Clapton, and several other stars and crew. Audio Commentaries - Disc two includes two commentaries for episode 4, two commentaries for episode 5, and one commentary for episode 6. Participants include cast members like Liam Cunningham and Iain Glen, along with director Matt Shakman, DP Rob McLachlan, and several other members of the crew. Audio Commentaries – Disc three includes two commentaries for episode 7. Participants include cast members Kit Harrington and Lena Headey, writers David Benioff & D.B. Weiss, director Jeremy Podeswa, and DP Greg Middleton. From Imagination to Reality: Inside the Art Department (HD, 46 min) – Presented in two parts, this is a great behind-the-scenes doc focused on the creation of the show's incredible sets. Fire & Steel: Creating the Invasion of Westeros (HD, 30 min) – This behind-the-scenes doc covers a more general overview of the season with cast & crew interviews. The participants discuss the characters, plot, stunts, and visual effects work. Conquest & Rebellion (HD, 45 min) – Presented in 1080p with Dolby TrueHD 5.1 audio, this bonus disc contains a retelling of Aegon's initial conquest of Westeros and the subsequent rebellions that occurred before the show started through simple animations and motion artwork. Likewise, the feature uses voice over from several cast members including Sophie Turner, Nikolaij Coster-Waldou, Aidan Gillen, and more. Though essentially just a longer version of the "Histories and Lore" supplements that are already included with every season, this is fairly well done and is a worthy watch for big fans who want to know more about the series' backstory. 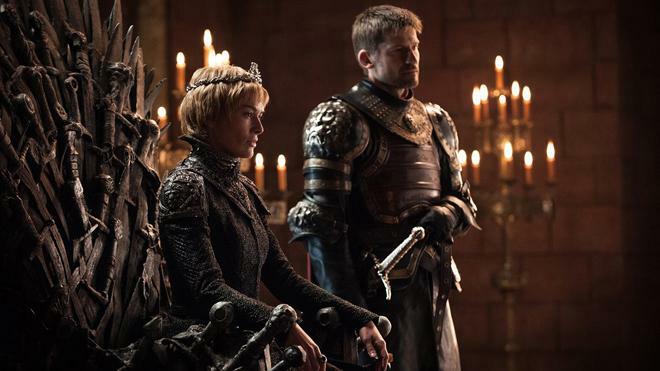 Game of Thrones: The Complete Seventh Season veers a little more into conventional storytelling tropes and rhythms than previous seasons, but the series remains thrilling and engrossing as a whole. Despite some minor encoding issues here and there, the video transfer is mostly great, and the Dolby Atmos soundtrack is demo-worthy. With eleven commentaries, a couple behind-the-scenes docs, and a bonus disc, the supplements are also very insightful. Highly recommended!